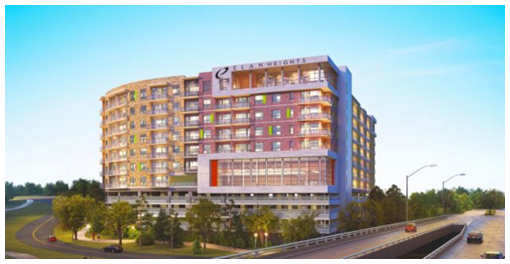 ​HOUSTON - The Woodland Heights apartment complex Elan Heights has begun preleasing units. The 326-unit community by Greystar at 25 Usener near White Oak Dr. and Taylor, on the site of the now-demolished Skylane Apartments. The seven-story development will offer apartments from 627 to 1,427 sf with monthly rents between $1,695 and $,3,375. "The community is minutes away from recreation at Stude Park, Buffalo Bayou Park and local walking trails," said Greystar director of real estate Betsy Valdes. The apartment market in Houston has changed since this and other high-end projects were announced, however. Economists have suggested that apartments are overbuilt in Houston, particularly given slowing job growth thanks to flagging oil prices. Rents in the Heights have dropped 15 percent over the last three months, according to Houston-based Apartment Data Services. ​Looking for more free data? Check out Houston's Multifamily Market Research!